Didn’t catch my Sci-Fi love story, A Virtual Affair, the first time around…? Well, you can always read it again before it goes into retirement. 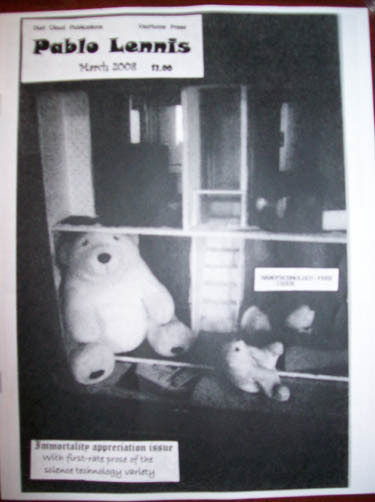 Below in the January 2009 issue of SURPRISING STORIES. Edited by John and Eric Thiel. This well-received story would be one of the final 30 hobbyist venues which will feature work of mine over the next twelve months. Featuring Work by: Steve Sneyd, David Zeldis, Lawrence Dagstine, Jamie Meyers, Herbert Jerry Baker, Gerald F. Heyder, Rose Gordy, Bob Bolin, Joanne Tolson, Albert J. Manachino, Anne M. Valley, Paul Truttman, Gary Every, and John Thiel. Reviews by Elmwood Kraemer. Art by Ramos Fumes and Peter Zenger. My New Years Resolution was to retire from many a small venue, with 350 publishing credits as rocket fuel, and see where I can take these crazy horror stories and science fiction-cluttered thoughts of mine. And while I will still be an integral part of the Small Press, I’ve decided to take a leave of absence from the hobby press to search for a little more. As I invest over four hours per day into a new novella with “true” emotion and real, identifiable characters, make up marketing materials and get ready for the premiere of my first short story collection, and outline fresh ideas for a hopefully pro-paying anthology, I really can’t wait to see what this year off from shorter work brings. In the meantime, please, enjoy what the publication above has to offer. There’s a ton of reprinted short stories over the last two decades from some very fine and familiar authors — old-schoolers! Not to mention articles on science and religion, book and movie reviews, and SF poetry. It’s a rather abstract issue, and I don’t only mean the art and fiction, but the book reviews and article subjects, too. Oh yeah, and did I mention poetry? This issue features works by: Rose Gordy, Steve Sneyd, Paul Truttman, Lawrence R. Dagstine, Gerald Heyder, Albert J. Manachino, Peter Layton, William Wake Wallace, McArthur Gunter, Hazil the Witch, Gary Every, Joanne Tolson, Elmwood Kraemer, and artwork by Maxine Colby. Acceptance No. 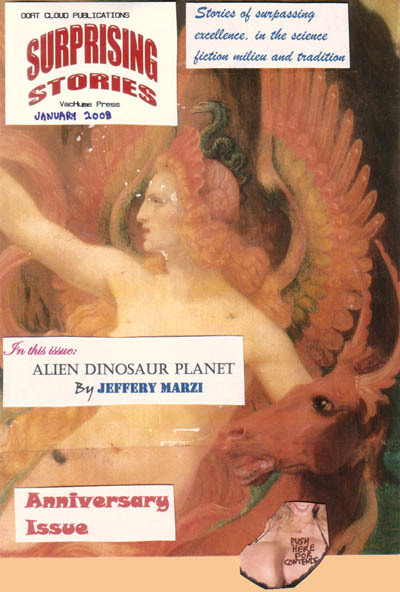 299 is also an appearance, and it comes to one of the longest running scifi fanzines out there (since the 1980’s). 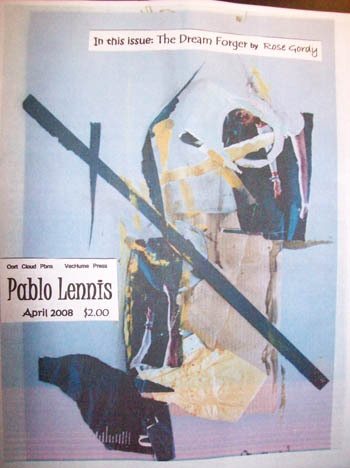 PABLO LENNIS. They also feature poetry, book reviews, movie reviews, news involving hard science and more. Edited by John Thiel, and published by Oort Cloud Publications, VacHume Press. My latest acceptance comes to a wonderfully entertaining little e-zine filled to the rim with hard science fiction, fantasy, and otherworldly poetry. Non-fiction and speculative fiction book reviews, too: Surprising Stories. Their current issue, No. #16, features my pulp asteroid tale: The Doomsday Initiative. My next appearance is scheduled for May or June. Or, pretty much, the spring-summer 2008 edition. 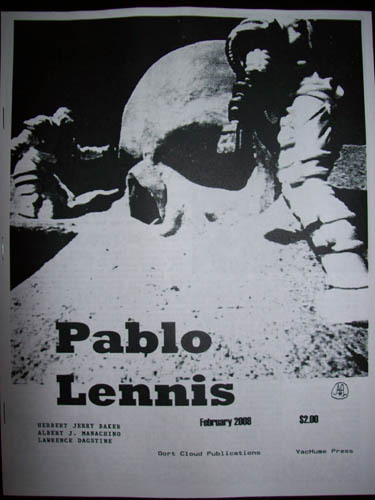 My latest acceptance/appearance comes to the longest running fanzine of science fiction and science fact, Pablo Lennis. Oort Cloud Publications, VacHume Press. Edited by John Thiel. The pages of PL are also where I made my first amateur appearance back in 1996. 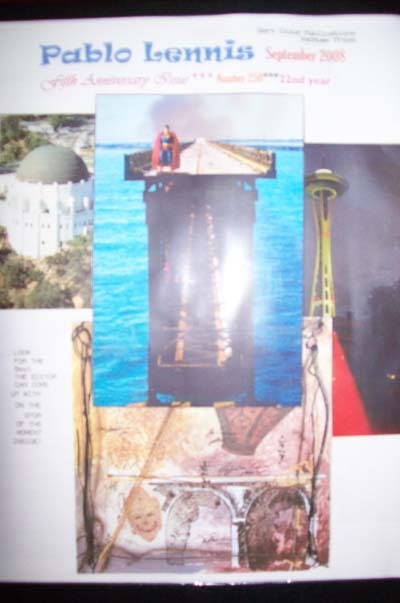 Fiction & Poetry by: Jeffrey Marzi, Lawrence Dagstine, Gerald Heyder, Joanne Tolson, Bob Bolin, Tracy Milletary, Albert J. Manachino, Gary Every, R.W. Marino Jr., Walter M. Chellberg, Hazil the Witch, Paul Truttman, Herbert Jerry Baker, Steve Sneyd, reviews by Elmwood Kraemer & John Thiel. Art/Illustrations by Ramos Fumes.